What is a normal total lymphocyte count? What formula does the absolute lymphocyte count calculator use? The absolute lymphocyte count calculator uses white blood cell count and lymphocyte percentage to estimate the total number of these immune system cells in one's blood. It also interprets the result in terms of HIV-induced immunodeficiency. Lymphocytes are a vital part of the immune system - they are the largest group among the many kinds of white blood cells (WBC). Their name corresponds to the fact that they are the main solid compound of lymph. This word is derived from the name of the ancient Roman deity of fresh water, Lympha. B cells - for humoral, antibody-driven adaptive immunity. A CD4 count of < 200 cells/μL is very likely if the ALC (absolute lymphocyte count) is below 0.95 ×10³ cells/μL and less likely if the ALC is over 1.700 ×10³ cells/μL. That means that the absolute lymphocyte count can be used as a rough, but easily obtainable marker of HIV-induced immunodeficiency. The calculated absolute lymphocyte count is expressed in thousands of cells per microlitre (10³ cells/μL). 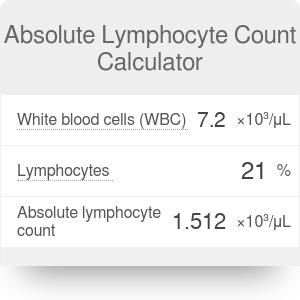 Absolute Lymphocyte Count Calculator can be embedded on your website to enrich the content you wrote and make it easier for your visitors to understand your message.